Getting flowers to grow in shady spots can be a challenge. City garden are particularly affected because of buildings, fences and trees. The key to success is choosing the plants that want to be in the shade. Not only is shade a problem under trees, but competition from the tree roots often create a surprisingly dry area. Lovely bright displays are possible by carefully choosing plants that are shade tolerant, particularly if you are willing to water regularly. My little city courtyard is only 16 x16 feet square and surrounded by house, garage and high fences. Yet it is an oasis of colour throughout the summer. Shade comes in a variety of darkness. Nothing lives in completely dark areas. You can cheat by painting your fences a brighter colour and by placing strategically hung mirrors or ornaments. I usually prefers low key flower pots but brightly coloured pots can sometimes add colour where shade is too intense and it's hard to get flowers to grow. 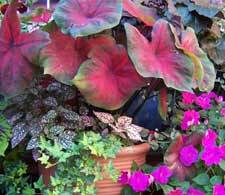 There are 4 main keys to success in planting a shade garden. Keep the planting in proportion to the size of your garden. By using a variety of different shapes, shiny or matt leaves, and large and small foliage, you can create variety that draws the eye and creates interest. 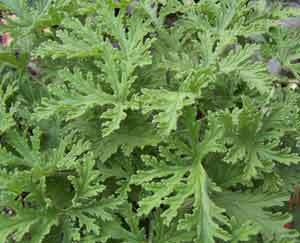 Many green plants are worth having around because of unusual foliage. Ferns are a good example. What is cooler and more restful than a maidenhead fern? English Ivy provides wonderfully shaped leaves in many varieties. I often include canna lilies in the shade garden for the fabulous exuberant tropical leaves, some brightly coloured. In shade they don't usually flower but the leaves are worth the effort. 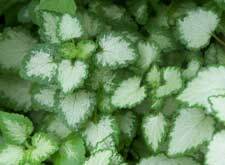 Many of the Begonias also have lovely furry foliage that provide texture and colour. Many plants have insignificant flowers and are grown for their coloured leaves. 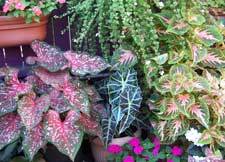 Such is the case for the Coleus (right), Caladium, Elephant ears, Polka Dot Plants, Hosta and any number of variegated plants. Many house plants fall in this category and favourites such as spider plants love shade and provide colour and interest. 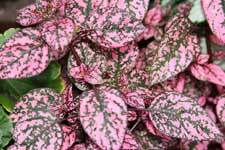 Coral bells come in a wide variety of colours including gorgeous bronze shades. All these plants will tolerate shade and provide a notable show even in quite dark conditions. Coleus is one plant I like to start from seed. I get a 4 inch pot and sprinkle seed on the soil, cover very lightly and let them grow for a few weeks. I can then choose the most brightly coloured plants. It's wonderful to see the variety that comes up. Getting seed from a couple of different companies will give you a nicer range of colours. Many flowers prefer or tolerate shade and can give you startling displays. Of course the invincible Impatience plants have been a mainstay of shady spots, both the regular and the showier Madagascar varieties will provide handsome displays if you can keep them watered. Lately the regular impatiens have suffered from a fungus that gradually kills them but the Madagascar varieties are not affected. 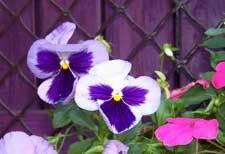 Pansies come in a variety of colours and sizes. 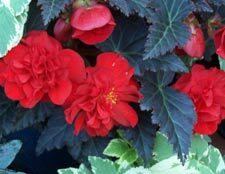 Begonias are also very shade resistant and can give absolutely stunning displays in almost fluorescent reds, oranges and yellows. Fuschia is another favourite flower that is very shade tolerant. Many geraniums (pelargoniums) can tolerate shade and will flower in a variety of colours. Some of my shady spots are quite dark and in that case I rotate the pots around and give the light starved ones a bit of sunshine occasionally. As you plant remember to keep your plantings in proportion. Canna lilies can be huge, many coloured ground creepers are small. It helps to roughly draw your garden out. When I'm planting I think of plants as tall, medium and short and place the short ones in the front and the tall ones in the back. 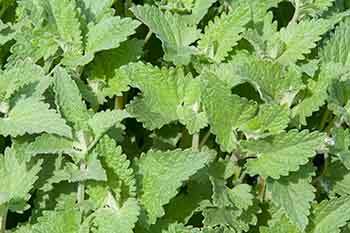 Many mints, geraniums and herbs have a lovely smell particularly when you brush against them. It is pleasant to have them on the edge where you can walk against them and enjoy the aroma. Get seeds. As a bonus they repel Mosquitos, bring it inside in the fall and put back out in the spring. Scented geraniums are the original scratch and sniff plant and are welcome in my garden because the have the most gorgeous minty smell when touched and they have lovely textured leaves. Don't forget to add a few catnip plants for the kitties. I have a page on gardening for cats here Link to catnip seeds It prefers some sun but will come up in shade. My gardening is entirely done in containers and as a result I tend to have more luck with annuals. I also bring in houseplants at the end of the season and they limp on in the house till I put them back out in the spring. 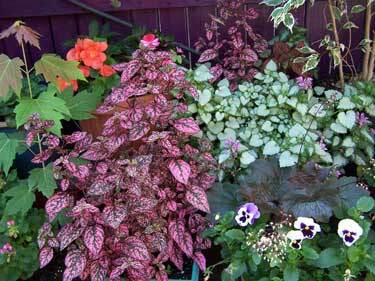 IF I had a perennial garden I would still infill with begonias and impatience, and the lovely caladiums and fushias. In my garden there are cat sized spaces between the pots to allow the kitties room to explore or take a nap in the cool shade. 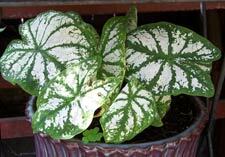 How do you know if a plant will do well in the shade -- there is no magic trick. Start with the proven ones and every year try a new plant or 2. Look at the labels. If they require full sunshine stay away from them. If they are partial shade or shade loving then give them a try. This is what my shade garden looks like at the end of the summer. The further away from the purple wall the more light there is. Near the wall there is no sun at all. Some plants get rotated in for short spells to brighten up a dark corner. Fushia is a star in a shade garden. There are drooping and upright varieties. Many variations in the flowers too. I bring mine inside in the fall and after sulking for a few weeks they will start flowering. Book A gardener's Guide to 500 Fuchsias. 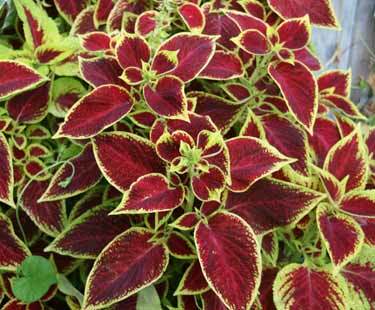 Coleus grows in shade or in sun. Amazing variety of colours available. 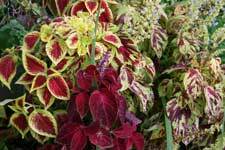 Cheap and cheerful they can easily be grown inside too.Rainbow coleus seeds Start many seeds and pick out the most colourful. Many perennial ground cover plants work very well in the shade. Choose variegated ones. If they get enough light they might also bloom.